An encroachment permit is needed anytime you wish to perform any work in or use the public right-of-way such as a public street or sidewalk. Applying for an encroachment permit is how you get permission to do work in the right-of-way, and assures that your work will be inspected to established standards and, upon acceptance, protects you from potential liability that may otherwise come about by substandard or unauthorized work. Minor Temporary Encroachment Permit- A minor temporary encroachment permit is intended for work with a specified, limited period of time including debris boxes, temporary construction, scaffolding, and tree trimming. Minor Continuing Encroachment Permit- An encroachment which is intended and permitted to continue for an indefinite period of time, but which by its nature is limited in size, scale or use so that the encroachment will have little or no impact on the public health, safety or welfare like, flat or low level landscaping, bike racks, newspaper racks, and signs/architectural features extending more than four feet (4’) into the public-right-of-way. Major Encroachment Permit- A major encroachment application would be needed for encroachments intended to continue for an indefinite period of time like, fences or walls higher than three feet (3') above natural grade, abutments for driveways and stairs, groundwater monitoring wells. 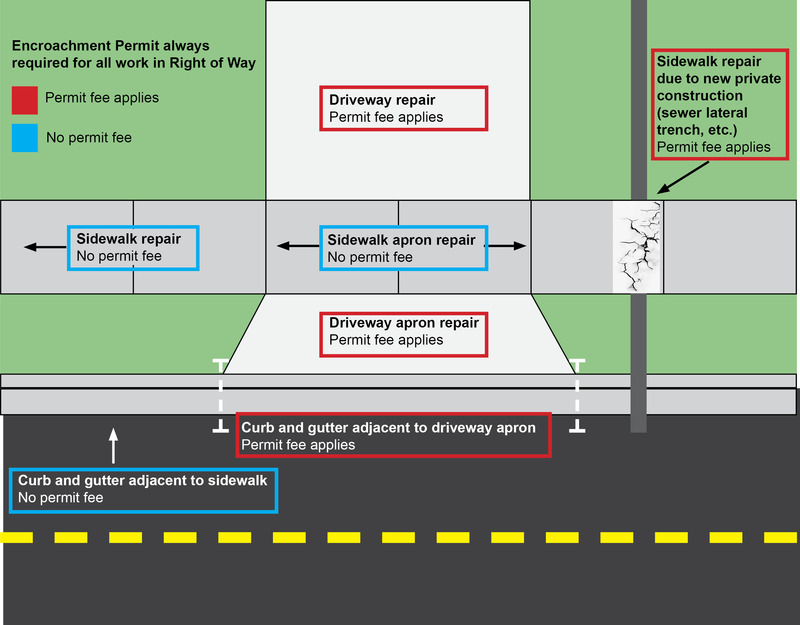 No Fee Encroachment Permit- A permit for sidewalk, gutter, and curb work with no fee associated. All requirements of a minor temporary encroachment permit apply except the fee. See diagram below for details on work associated with a no fee encroachment permit. See Sanitation District for Sewer Permits. A detailed plan shows the exact location, a more precise extent of the work zone, the work proposed and details of the improvements. A key map shows the general project location and approximate extent of the workzone. Underground utilities can be shown on the detailed plan or as a separate map. We use this to generally locate where subsurface utilities exist, and to avoid conflicts with existing facilities. Temporary traffic control requirements, devices, and setups can be found in Part 6 of the CA Manual on Uniform Traffic Control Devices (MUTCD). Part 6 includes temporary traffic controls such as for workzones. Chapter 6H provides typical applications or general setups. A. Secure a policy of broad form commercial general liability insurance naming the city as an additional insured in an amount not less than one million dollars ($1,000,000.00) and in a form as approved by the director. B. Liability insurance shall not be required of any utility or special district which is authorized by law to establish or maintain any works or facilities in, under, or over the public right-of-way. An A or C-12 license is required for all paving. Other licenses may be required based on project scope. What are the City's requirements for construction? Most common projects in the Right-of-Way (ROW) are detailed in the Uniform Construction Standards (UCS). Additionally the City has specific requirements for trenches and pavements. Forms are required for the lip of the gutter. Asphalt shall be removed for installation of the form. For repaving the asphalt a conform is required, with a clean cut 2' from the lip of the gutter to ensure a quality patch. Cuts into moratorium streets (PCI 70 or greater) require curb to curb full width resurfacing. Check out the Moratorium Street Map!